Not many people buy 2-door coupes any more, and the tested ATS-V demonstrated why: The rear seat is tough to get to, and it’s short on space. To slap a “V” badge on Cadillac’s compact coupe requires packing in a lot of performance-oriented equipment first. Foremost is the twin-turbocharged 3.6-liter V6 engine and six-speed manual or eight-speed automatic transmission. That engine sits under a carbon-fiber hood with huge slots for cooling and aerodynamic benefits. Underneath are a fully independent suspension, 18-inch alloy wheels, uprated Brembo-brand performance brakes, Magnetic Ride Control damping, electronic limited-slip differential, and ZF rack-mounted electric steering. Technological tricks include things like launch control and condition-specific traction-management settings. Naturally, it doesn’t come cheaply. (We’ll get to the details in a bit.) It does, however, add up to a car that Cadillac claims will go from 0 to 60 mph in 3.9 seconds and top out at 189 mph—should a buyer want to test its mettle at some upcoming track day. “Track day” is not exactly what this driver would have called any of his wintertime work commutes in the ATS-V coupe that Consumer Guide® editors sampled. 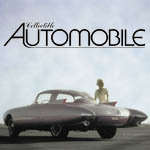 Still, the car couldn’t help but drop strong hints of its capabilities, even as it showed itself to be a fairly accommodating daily driver. Beneath the ATS-V’s serious-looking hood is some equally serious power, enough to launch the little Caddy to 60 in less than 4 seconds. With 464 horsepower and 445 lb-ft of torque at its disposal, the ATS-V is always ready to go from a stoplight or make a brisk expressway pass. Throttle response is quick, and there’s plenty of grunt in the bank. CG’s test car came with the nice-shifting six-speed gearbox that works well with a firm but not inordinately heavy clutch. The manual trans is outfitted with an Active Rev Match function on adjacent gears for faster, smoother shifts, and “no-lift” capability that allows for upshifts while the accelerator is fully depressed—an aid in keeping down lap times on those aforementioned track days. In case anyone is wondering, and they might since even hot-shoes have to stop now and then to fill up, the ATS-V with manual is rated by the EPA at 17 mpg in city driving, 23 mpg on the highway, and 19 combined. This tester got 17.98 mpg from a stint of 173.6 miles that included 51 percent city-style driving. No surprises here: The ride is firm, and it hits a little hard at times, though the constantly adjusting Magnetic Ride Control, which changes the level of resistance in the fluid in the shock absorbers, does what it can to maximize comfort. Handling is really good, though, even in the base “Tour” setting, which is fine for the vast majority of driving. Clicking into “Sport” brings more steering resistance that would probably be better appreciated on a public road somewhat twistier than the Interstate that connects this writer to CG Supreme World Headquarters. (“Track” and “Snow/Ice” settings are also available.) 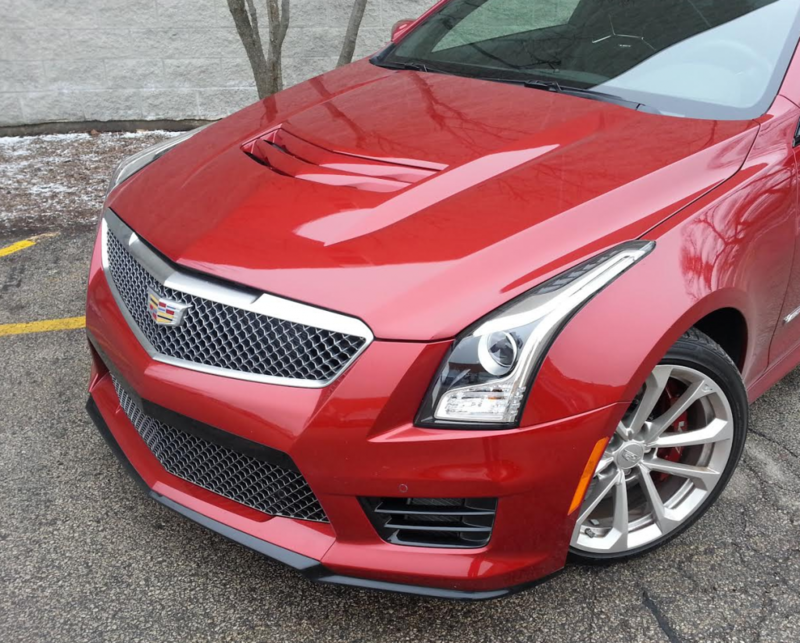 The Brembo binders haul the ATS-V down quickly and securely. The car in this test was outfitted with Recaro front seats, a $2300 extra. Like the base seats, they are heated and feature sueded microfiber inserts. However, the optional seats provide more side bolstering for better grip—though they are adjustable “only” 16 ways, not 18 as in the standard seat. 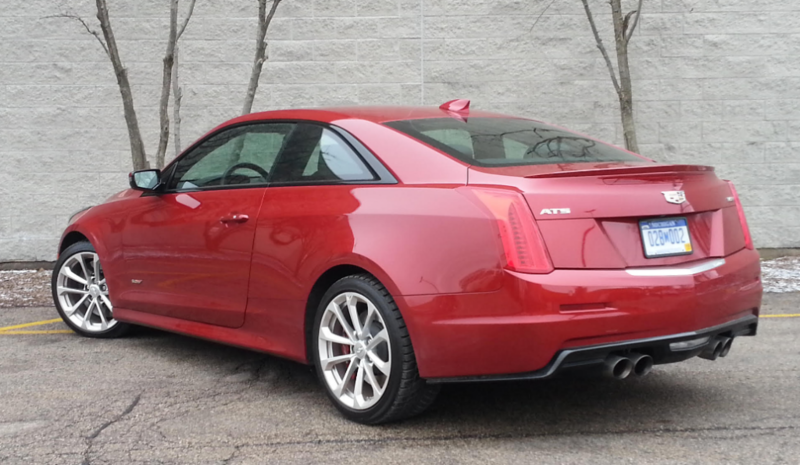 When this tester drove a more mainstream 2015 ATS coupe, he left it with a sore back. There was no such complaint after five days in the “V” with the Recaros. Our test vehicle was fitted with what is likely to be the rarely ordered 6-speed manual transmission, which shifted with smooth precision and included rev matching. Interior décor uses microfiber accents and sections of carbon-fiber trim for a purposeful, sporting look. 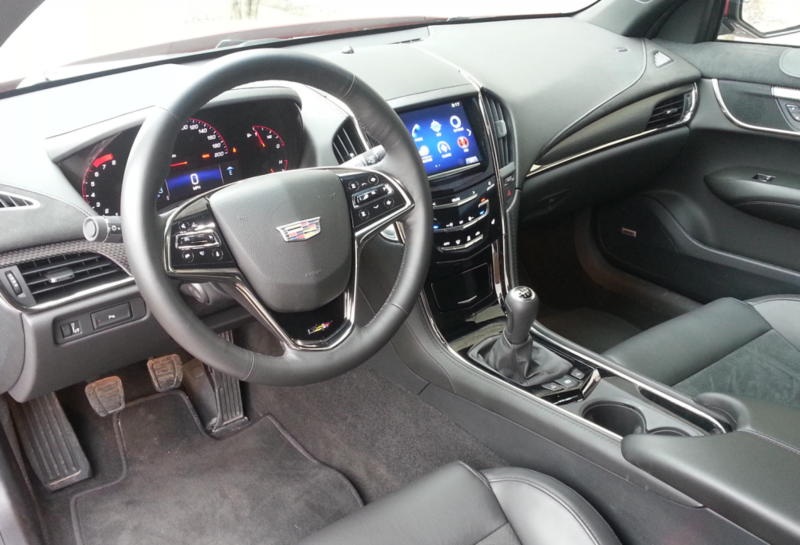 Other standard interior amenities include a vibrant electroluminescent instrument cluster and vehicle-information display, premium Bose audio system with active noise cancellation, satellite radio, Cadillac’s CUE touchscreen infotainment system with Bluetooth connectivity, rear camera, front and rear park assist, pushbutton starting, wireless phone charging, and an integrated 4G LTE Wi-Fi hotspot. Among the options on the test car was a group with a navigation system and upgraded surround-sound audio. 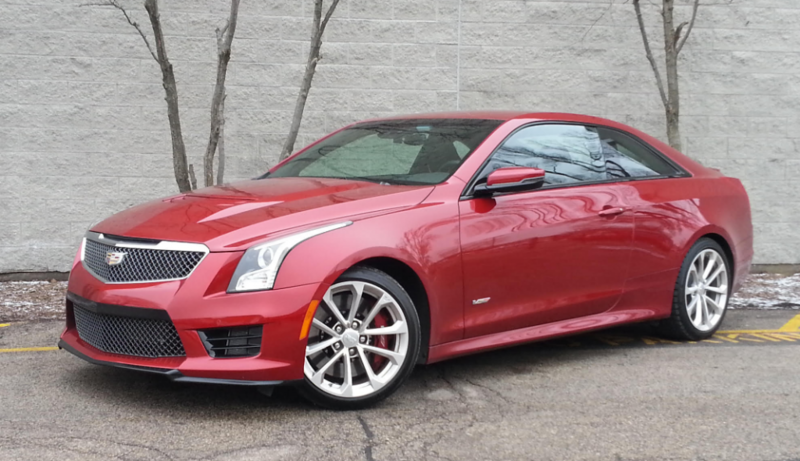 In terms of passenger and cargo room, the “V” coupe is pretty much like any other two-door ATS. The coupe has an inch less head room than the comparable four-door sedan, but there’s enough head room for most front-seat passengers, and entry and exit doesn’t take too much special effort. Rear seats are another matter, however, from very limited head and leg room to difficult ingress/egress. The glove box, padded-top console bin, door pockets, and two open console cup holders serve the needs of front-seat passengers. Those in the rear have cup holders built into the raised padded area between the seats, and pouches on the back of each front seat. Rear seats fold in a 60/40 split to extend the trunk space. Over-the-shoulder and straight-back vision for the driver is fairly good. CG’s test car just beat $70,000, but that was with options and shipping included. The base price is $62,665. That’s a big number for a car that seats up to four only if two of them are about as compact as the ATS itself—but it’s only $135 per unit of horsepower, or $332 per available mile per hour. It may not look much different than an “ordinary” ATS coupe, but the added “V” makes a world of difference in performance — and price. Written by: The Daily Drive staff on February 25, 2016.